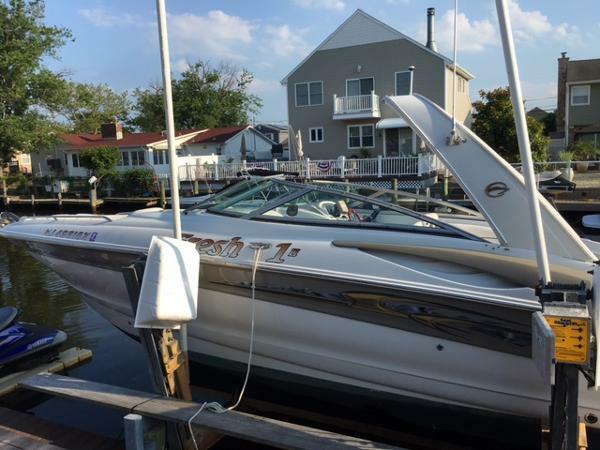 2006 Crownline 320 LS 2006 Crownline 32 LS powered by twin Mercruiser 5.0 M.P.I. 's with only 459 Hours of use. The dual walk-thru from the extended swim platform allows for safe and easy boarding from either side of the boat. 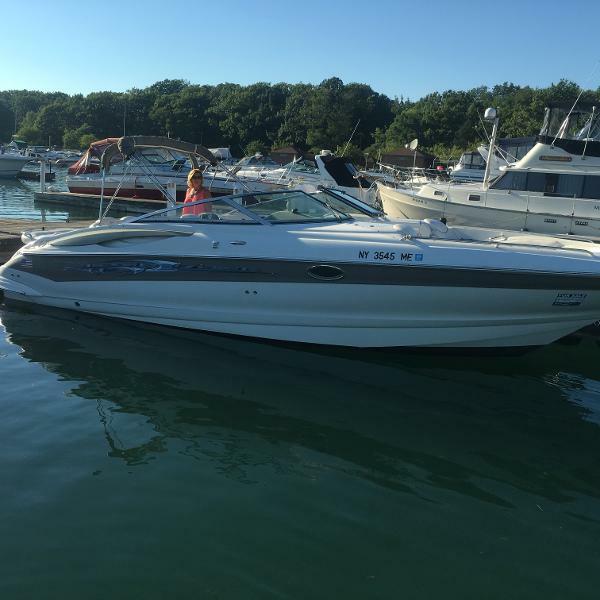 Once on board you will find everything you and your family will need to make boating a pleasure. There's an enclosed head compartment with a fresh water shower, sink, vanity and Vacu-Flush toilet. The cockpit wetbar, sleeping berth and microwave are just a few more features you can all appreciate. In addition to standard cabin and bow covers, includes a full camper canvas enclosure. She also has a windlass anchor and power trim tabs with digital display on dash. Washed, waxed, and polished in July 2016, so she is super-shiny, super smooth, and fully protected! 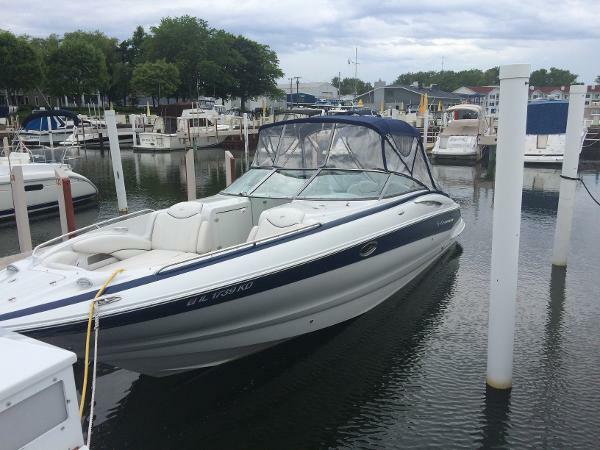 This boat turns heads, gets many compliments, and attracts on-lookers on docks. Most importantly, she offers a complete sense of safety and security when handling larger waves. She is 'yacht-certified' and can accommodate multiple families with ultimate comfort. Sheltered under covered at marina dry storage her entire, and stored out of the water. 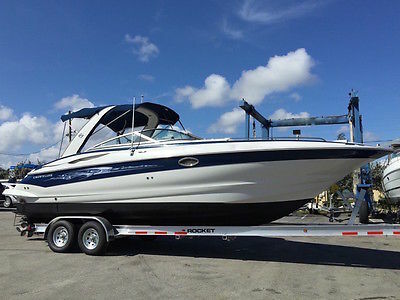 This is a BIG luxury family boat with the capability to excite the captain with her awesome power and handling..... See Below NADA for OPTIONS Right now the boat is in line to get a full 100 Hour service before she is ready for her next sea trial. Spark Plugs, Filters, Oil and Fluid Change, Impeller/WaterPumps, and gear oil change. 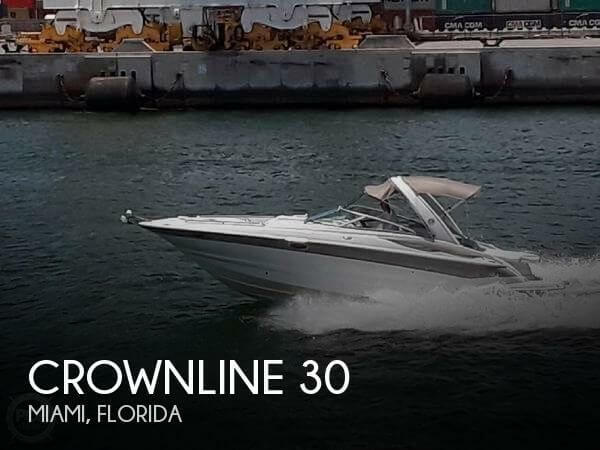 2008 Crownline 320 LS BEAUTIFUL, PERFECT! YOU NAME IT! IT HAS IT! CALL AMY TODAY FOR DETAILS AND SHOWING! Built on the exclusive F.A.S.T. Tab platform, the 320 LS comes with an array of standard features. Double walk-thru from transom to cockpit, midship sleeping cabin with a port light and privacy screen. Just forward of the helm is an enclosed head with a fresh water shower, a sink, vanity and Vacu-Flush toilet. A few of the value-added extras include a flip-up double seat at the helm, an aft bench which converts to a sunbed, a premium stereo system and much more. 2006 Crownline 320LS LIFT KEPT TWIN MERC 350'S / 330 HRS / LIFT KEPT / VERY CLEAN! THIRTY TWO FEET OF CROWNLINE BEAUTY WHICH COMES WITH A STUNNING LIST OF STANDARD FEATURES-A SLEEPING CABIN, A HEADPARTMENT, A FULL WET BAR, ETC.. SHE HAS A GUEST FRIENDLY LAYOUT AND SPORTY PERFORMANCE LIFT KEPT, THIS BOAT HAS BEEN LIGHTLY USED AND MAINTAINED IN EXCELLENT CONDITION BOTH MECHANICALLY AND COSMETICALLY. SHE IS POWERED WITH TWIN MERCRUISER 350 MAG MPI'S (300 HP EACH) WILL CRUISE HER AT 35 KNOTS AND TOP OUT IN THE UPPER 40'S. SHE HAS ONLY 330 HOURS ON HER. SHE HAS A VACUFLUSH HEAD, A MICROWAVE AND A NICE LIST OF AMMENITIES. 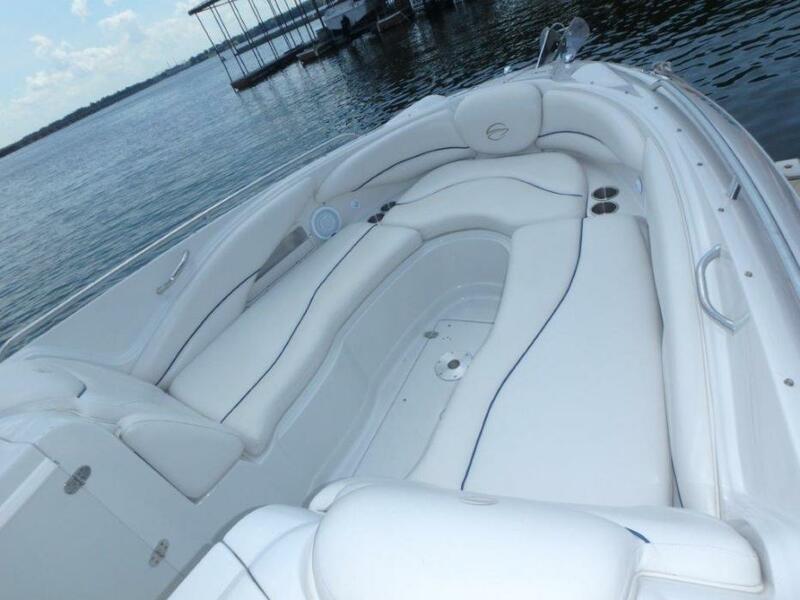 IF YOU ARE SEARCHING FOR A LARGER BOWRIDER TO GET OOUT ON THE WATER WITH YOUR FAMILY AND FRIENDS, COME TAKE A LOOK. YOU WILL NOT BE DISAPPOINTED. OFFERS ARE ENCOURAGED AND WILL BE GIVEN SERIOUS CONSIDERATION..... TRADES CONSIDERED!